Danny Rowe’s second-half double made the difference for the Coasters in the Midlands, on a massive afternoon where they toppled the team who started the day as joint-league leaders. The Coasters made two changes from their win against Wrexham the week before, as Danny Philliskirk and Zaine Francis-Angol returned, in place of Arlen Birch and the injured Lewis Montrose. The hosts made just the one change, as Hylton replaced Hawkridge in a like-for-like alteration. The Coasters started as the stronger of the two sides, with the first real sight of goal falling to midfielder Ryan Croasdale. Nick Haughton held the ball up 25 yards from goal and played it into the path of the onrushing Croasdale, whose first-time effort went narrowly wide of the post. Solihull then got firing, and the direct, aerial tactic that they had made massive progress within the league became apparent. 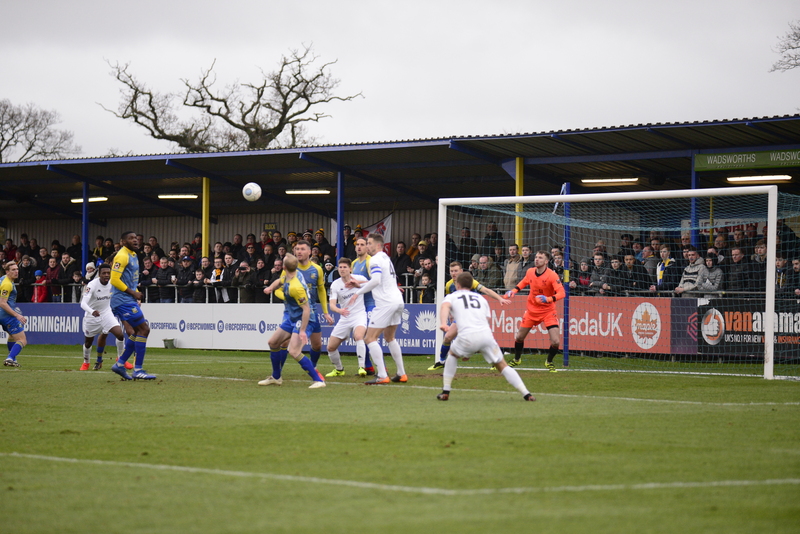 Osbourne’s corner was met by the towering Daly, who had his goal-bound header cleared off of the line by Ryan Croasdale. Chances fell for both sides throughout what was an open game – with Solihull presented a golden opportunity after a mix up between Lynch and Byrne. The ball was nicked off of them by Blissett, but Odusina was on hand to clear the danger, and earn a goal-kick in the process. Solihull continued to mount pressure, and nearly found the breakthrough in Danny Wright’s 25th-minute header – only for Jay Lynch to deny him in great fashion, keeping the scores level. The Moors’ next big chance wasn’t denied by Lynch, and instead by the woodwork, after Jamey Osbourne sent an effort crashing off of the bar and behind, crucially, not making the pressure pay. The second half saw the Coasters fly out of the traps, with an early chance presented for Dan Bradley, after a smart one-two with Danny Rowe. Rowe’s weighted pass found his team-mate in space, but Bradley’s effort was saved well by Boot. The tails were up for the Coasters though, and the breakthrough shortly followed. Nick Haughton’s inch-perfect diagonal pass found Zaine Francis-Angol bursting forward, who did well to look up and find Rowe 6 yards from goal. Rowe’s initial effort was blocked by Daly, but the striker’s perseverance paid off, as he nestled a slick effort low into the right-hand corner at the second time of asking. The lead didn’t last long, however, as on 67 minutes, The Moors levelled through Jamey Osbourne. After persistent build-up play, the ball fell to Osbourne outside the box, with the midfielder striking it into defender Francis-Angol, with the unlucky deflection taking it beyond the outstretched Lynch. With the bumper crowd behind them, The Moors would have fancied themselves to kick on and get the winner, but the National League’s top goalscorer hadn’t had the final say on the matter. The decisive move started out wide when Dan Bradley’s pinpoint ball found Rowe from thirty yards. Rowe toed and froed between his left and right foot, before deciding to strike with his left, burying it into the same corner that he’d finished his first. 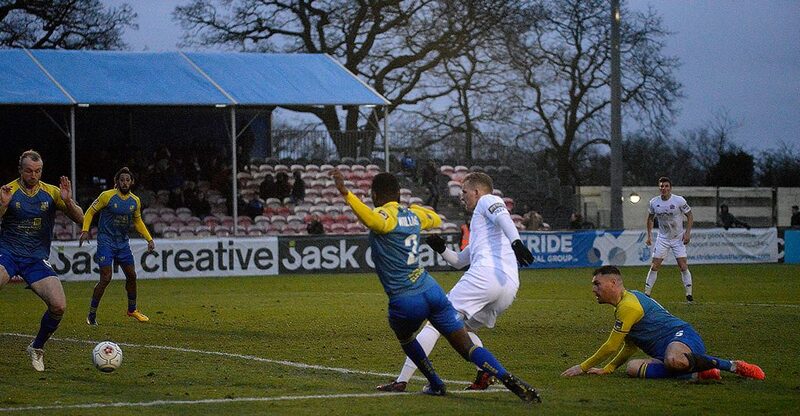 The goal stunned The Moors, but affording that kind of space to the league’s top goalscorer often ends in one way. The aerial bombardment began again soon after, with long-throws and corners continuing to test the Coasters back-line, but Neill Byrne and Jordan Tunnicliffe continued their excellent afternoon, keeping them at bay. As the game veered towards its conclusion, substitute Luke Maxwell tried his luck from distance, but it skewed wildly over, and moments later the whistle came, confirmation that the Coasters had done enough to record a fantastic win on the road. “Obviously a good win, in a game that I think we started well,” said Manager Dave Challinor. Solihull Moors: Moors: Boot, Williams, Reckord, Storer (C), Daly, Gudger, Osborne, Carter (Maxwell 77’), Hylton (Hawkridge 82’), Blissett (Yussuf 64’), Wright.